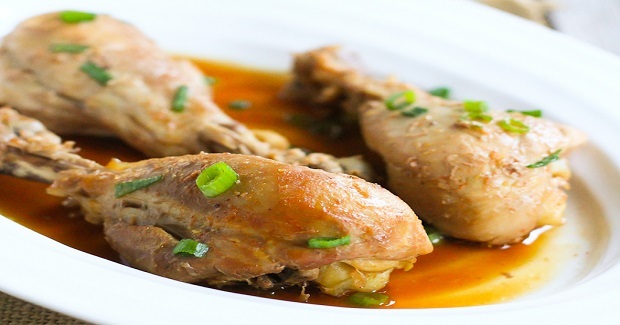 Slow Cooker Adobo Chicken Recipe - Gutom Na! Posted on Wednesday, November 2nd, 2016 at 8:01 am. In a medium bowl, combine the soy sauce, vinegar, Sriracha, brown sugar (or agave/honey), garlic, ginger and pepper to taste. Arrange the chicken in an even layer in the bottom of a slow cooker. Add the bay leave and pour the sauce over the chicken. Cover and cook on HIGH for 2 to 3 hours or on LOW for 4 to 6 hours, until the chicken is cooked through and falling off the bone. Discard the bay leaves. Serve garnished with scallions.